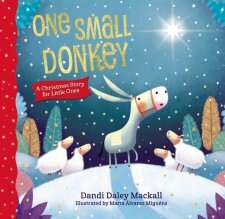 Snuggle up in front of a warm, cozy fire this Christmas and teach your tiny tot that though he is small, he too can do big things for God with the sweet board book, One Small Donkey. This story follows a donkey who feels inadequate as he sees large horses prancing about. He wishes he were quicker and not as slow when his master calls for him. He trudges through and makes his way to Bethlehem. His reward? Witnessing the birth of an ever so special gift, God's son. This book presents the story of Jesus' birth in a way that a young child can understand. The pictures throughout the book are bright and creative and the cover sparkles with gold. Any young child would be thrilled to open this book on Christmas morning!